Hungry for the sediment they once got from the Mississippi River, the wetlands of the Mississippi delta are sinking. Like the lower Mississippi, the upper reaches have been extensively engineered with levees, locks, dams and dredging. These measures are intended to control floods and maintain a nine-foot channel for the barges that transport millions of tons of grain and other products along the Mississippi, Missouri and Ohio Rivers. The dams have converted large parts of these rivers into a series of lakes, where sediment settles out of the slow-moving water. As a result, in the Upper Mississippi, "90 to 100 percent of the sediment is caught by dams," according to Southern Illinois University geologist Nicholas Pinter. Sediment makes the river bottom less hospitable to the plants and animals that naturally inhabit it. 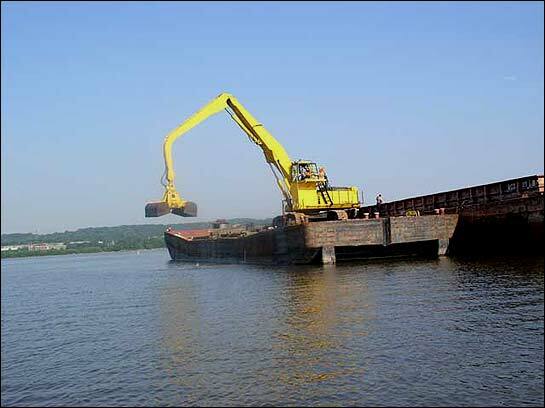 But "dredge spoils" -- sediment dredged from shallow spots for the deep navigation channel are not easily disposed of. When stored on land, this dredged-up stuff can smother plant communities and cause ecological havoc. A second option, Pinter says, is to pump the spoils downstream. 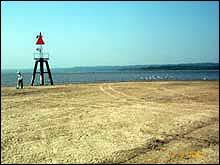 More dredging would be needed when the spoils settle further down-river, he admits, "but this is an initial measure that will help restore some of the natural sediment flux." Dredging is a fact of life, he says, and while pumping sediment does pose "an engineering challenge, so does the destruction of coastal wetlands. It's a matter of properly balancing the costs and benefits of each approach." Dredging is also the root of a second idea for restoring southern wetlands -- dumping the sand and silt on a barge and shipping it south. This program, advocated by John Marlin of the Illinois Waste Management and Research Center, would kill three water-woes with one stone -- it would deepen some of Illinois's sediment-choked rivers, improve fish habitat, and help restore delta wetlands. Unfortunately, Marlin could not get an okay from his higher-ups to talk with us. However, test projects using silt from the Illinois River to restore an old mine and a degraded industrial site have already begun. When we revamp flood protection for New Orleans, what works, and who calls the shots?